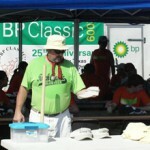 From Planet BP: Torch Classic project garners Houston award. Work by BP volunteers to transform raw land into a sea of green at Texas City’s western gateway has garnered recognition from the city’s large neighbor to the north. Some of those volunteers were on hand when the city of Texas City received special recognition from the Keep Houston Beautiful campaign and the 2009 Mayor’s Proud Partners competition at an awards luncheon on Nov. 16 at the Houston Post Oak Hilton Hotel.